It’s been, by far, the most requested feature in Happy Mood Score. Starting today you can create teams and group your employees into teams. Now you have an extra layer of information because you can filter all the dashboards, metrics, trends and rankings by team. 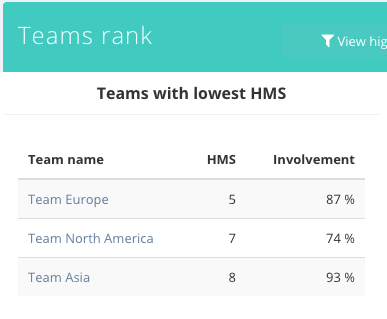 You can see which teams have the lowest (or highest) HMS or involvement. Detect any problems and take measures to avoid problems with unhappy employees. There are no limits in the number of teams you can create. Happy Mood Score is the perfect tool for companies with distributed teams, digital nomads or remote workers. Feedback, peer to peer rewards and ideas mixed into a powerful gamification engine that will help you to engage your employees, track their mood, detect problems and keep them happy. Try Happy Mood Score now.